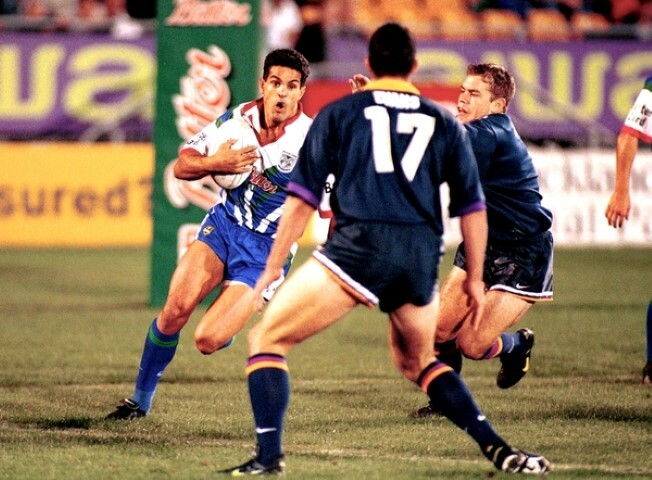 Flashback Friday this week we go back to the 1998 season where the Warriors travel to Melbourne to take on the Storm. These two sides have a history of enthralling contests and this game shows the rivalry and competitiveness between the two teams stretches back almost 2 decades. A forward pass was all that stopped the Storm from skipping out to an early lead within 5 minutes of this clash. The opening try of the contest ended up being from the away side and it was Joe Galuvao who crashed over in the 14th minute to not only bring up the first try of the match but also the first try of his 1st grade career. The Warriors looked likely to go in again not long after thanks to a beautiful offload from Awen Guttenbeil that put Anthony Swann straight through a hole in the Storm defense to crash over the try line. The decision was sent upstairs but was ruled "NO TRY" due to a forward pass. Who remembers the video ref calling on those? That's something that has slipped my mind! The Storm struck back through Kiwi legend Tawera Nikau off a pass from another kiwi legend, Richard Swain, to make the score 8-4 in favour of the Warriors outfit. In the 34th minute the Warriors were again disallowed a try, this time due to Lee Oudenryn knocking the ball on as he attempted to gather in a Stacey Jones bomb. Not long after and with half time within sight, Syd Eru scurried over from dummy half to give the Warriors a 14-4 half time lead. Melbourne came out in the 2nd half looking to chase down points and it wasn't long before they crossed the line with a beautiful backline move that went through the hands of Swain, Kimmorley and Hill making the scoreline read 14-8. A future Warriors player (Tony Martin) then crossed again for the Storm to get the home side back to 14-14 and with all the momentum they crossed quickly after through Robbie Ross to gain the lead for the first time at 20-14. With the clock winding down Gene Ngamu stepped straight through the Storm defense and made it look all too easy to score just to the left of the uprights. With a conversion to lock the scores up Gene made a meal of the easy attempt and the Warriors remained 2 points behind, 20-18. 3 minutes remaining in the contest and the Storm were hot on the attack right in front of the uprights. Kimmorley took the option of field goal giving the Melbourne side a 21-18 lead and likely victory with little time remaining, the Warriors on the other hand had other thoughts. With the siren going off in the background, the Warriors were shifting the ball wide and playing some razzle dazzle footy until Stacey Jones ended up with the ball and put a bomb up hoping for a miracle. In what looked like U/8's swarming to the ball as it came down, it bounced off a good 20 odd blokes before ending up in the hands of the Warriors team who then shifted it left through the hands with open space for Tatupu to score the easiest try of his career and win the game. Let's face it, there had to of been a Warriors knock on somewhere in that final play but as the history books suggests, it was a fair try and the Auckland Warriors came away with the 2 points thanks to a last second miracle.